Many in the vaping community regard squonking as the future, but even though squonk mods have been around for a couple of years now, one thing has prevented them from going mainstream – the price. 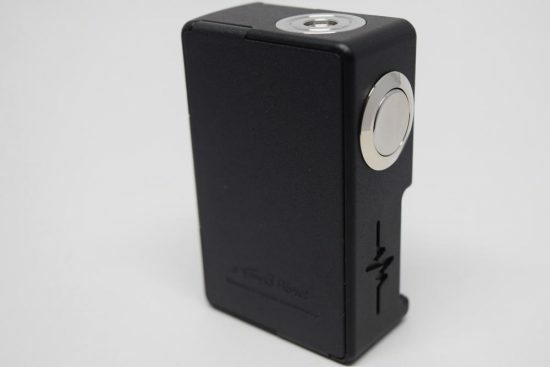 These things are really expensive, with prices ranging from around $100 to several hundred, and with so many other more affordable devices on the market these day, it’s no surprise that people have been reluctant to jump on the squonking train. But if the Vandy Vape BF Box Mod is any indication, squonking is about to become much more popular. 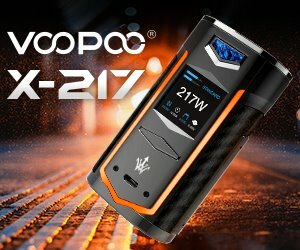 The Chinese manufacturer has partnered with Tony B of the Vapor Trail YouTube Channel to bring squonking to the masses. 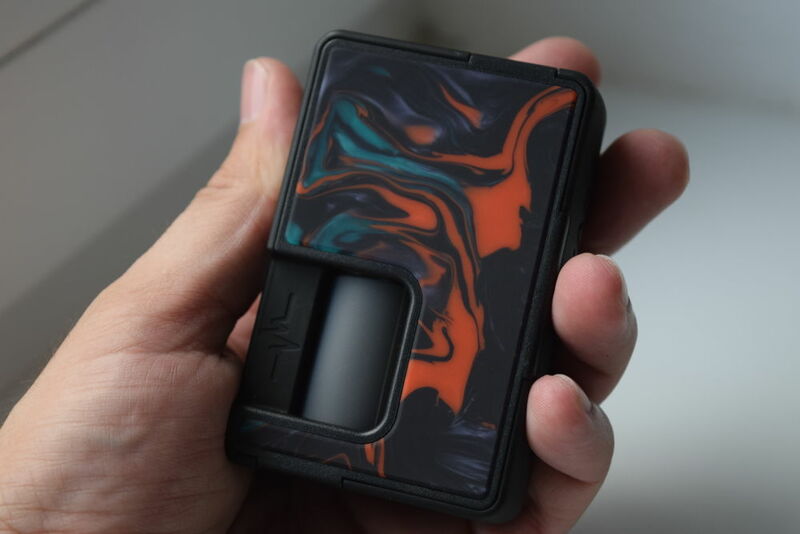 They came up with a way to lower production costs on their little squonker considerably, without compromising on the quality of the vaping experience. For those of you who still have no idea what squonk mods are all about, they are basically hybrid vaporizers that allow you to enjoy the excellent vaping experience of a dripper without actually having to drip all the time. Before we get into the nitty gritty of this review, I do want to point out that the Vandy Vape Box Mod is a mechanical mod. That means that is doesn’t come with any of the fancy protections you can find on most regulated devices, like short circuit protection, overheating protection or low resistance protection. You need to have sound knowledge of both Ohms Law and battery protection measures to keep yourself safe while using it. You’ve probably heard about batteries exploding in people’s hands and pockets, so if you don’t want to put yourself at risk, either don’t use mechanical mods or learn to use them properly. 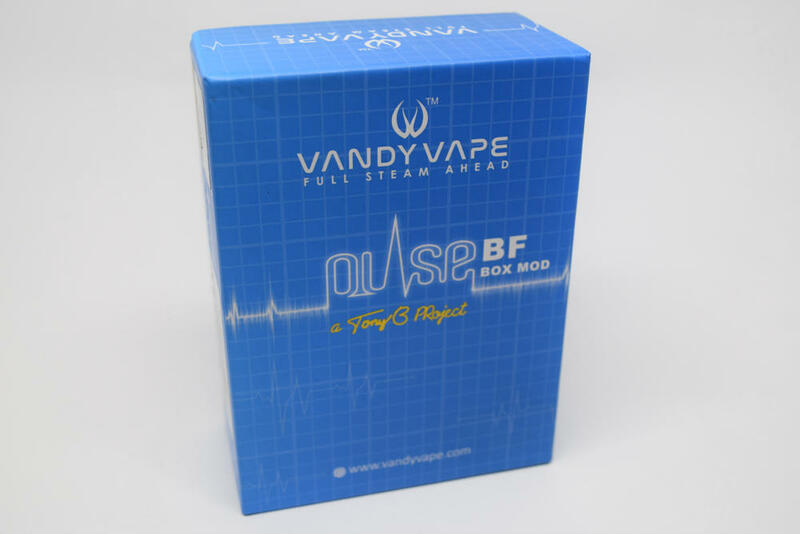 The Vandy Vape BF Box mod comes in a blue rectangular box with the company logo, the “Pulse” logo and a reference to Tony B on the front, as well as a list of features and the kit contents, on the back. On the sides of the box, we have the usual legal warnings, a scratch&verify authenticity sticker, as well as a batch number, device id and serial number. As far as packaging goes, this is definitely among the best I’ve seen, both in terms of design and information included. 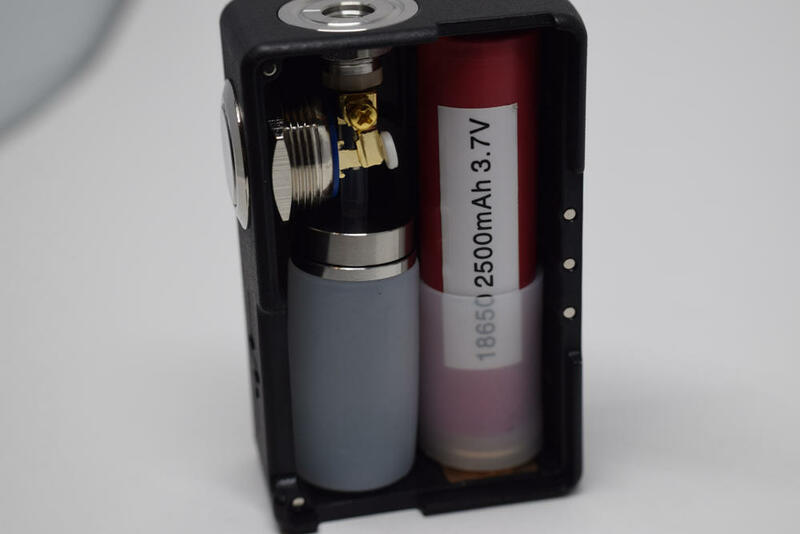 Inside the box, we have the squonk mod placed in a Styrofoam holder, a user manual translated in several languages, and a small zip bag containing replacement magnets for the detachable panels of the device as well as a spring-loaded pin for the kill switch (more on that below). Vandy Vape’s squonker measures just 77.6 mm x 50 mm x 27.5 mm and is primarily made of a material called Nylon ABS. 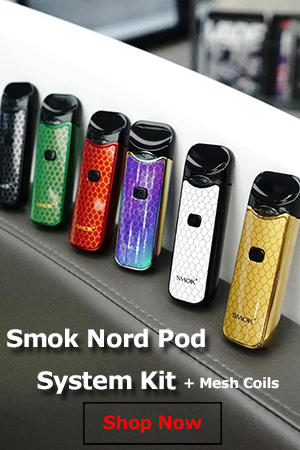 From what I can tell it’s basically a hard plastic, which does feel a bit cheap in the hand, at least compared to zinc alloy devices, but has the advantage of making the mod very light – just 81 grams without a battery. I suspect that switching to a cheaper material was one of the main ways that Vandy Vape was able to lower the price to around $30, so I could never consider this a con. If anything, it’s a big pro. The mod features two removable panels on both of its sides, making it easier to remove both the battery and the squonk bottle for refilling and cleaning. The panels are held in place by a series of magnets and are very sturdy. If any of the small magnets happen to come off, Vandy Vape includes a few spares which can be super-glued in place. 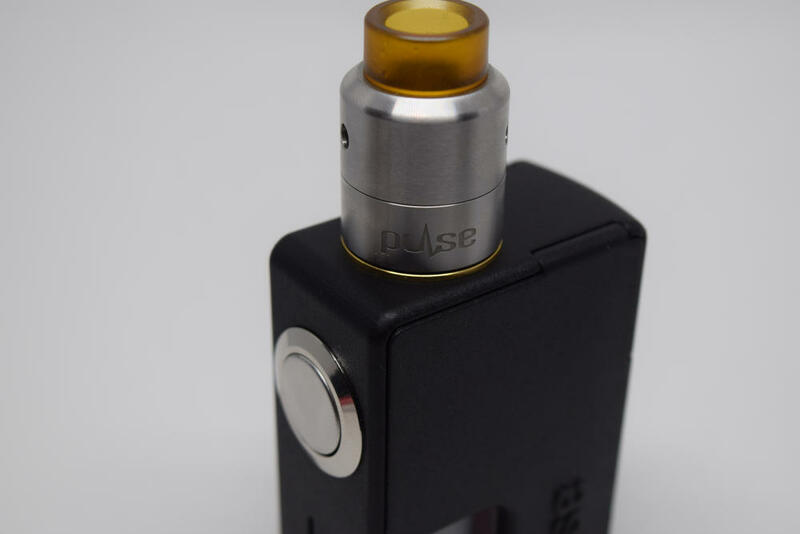 On the outside, the Vandy Vape Pulse isn’t the most impressive looking mod. 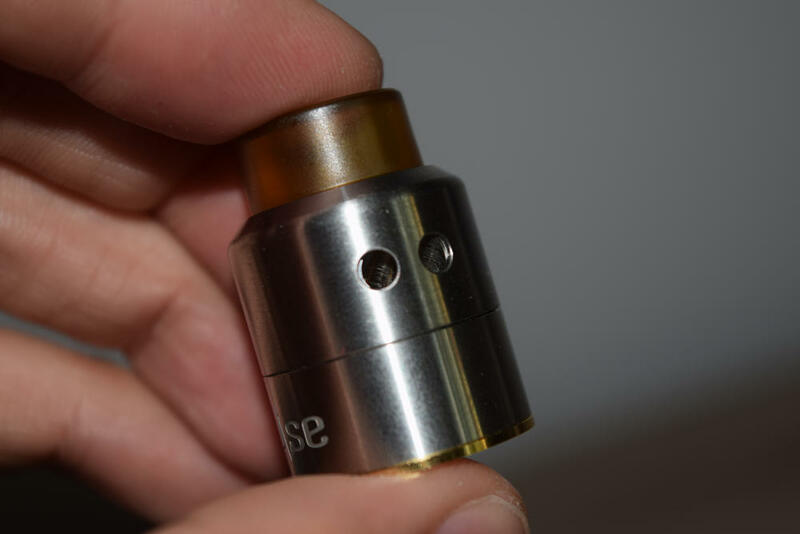 It has big power button right under the punctured 510 connection, a big hole cut into one of the holes so you can easily squeeze the juice bottle inside and feed e-liquid to the atomizer, and some aesthetic elements like the “Pulse” name and logo, a reference to Tony B’s contribution to this project and the Vandy Vape name. 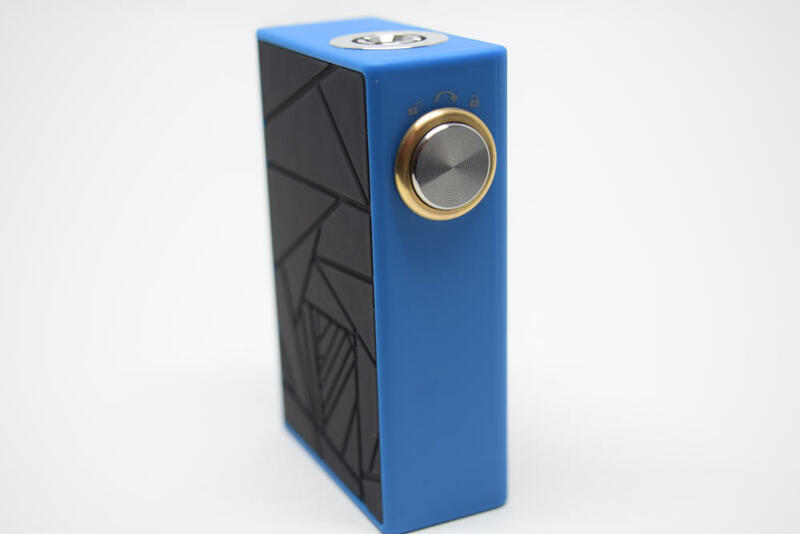 This is definitely not a mod that’s trying to get your attention with its design and the quality of the materials, but rather through its squonking abilities and affordable price. 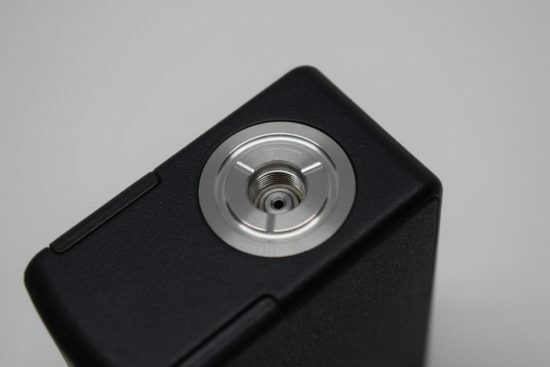 The large fire button isn’t the clicky type we usually see on regulated mods, but rather a spring-loaded one with a lot of travel, to prevent accidental firing as much as possible. It also protrudes from the mod by quite a bit and has a protective ring around it, which also prevents the button from being pressed all the way down if pressed against something by accident. Removing both side panels to get a view of its innards, you can see that the Vandy Vape Pulse BF, like most squonk mods for that matter, is a barebones device. 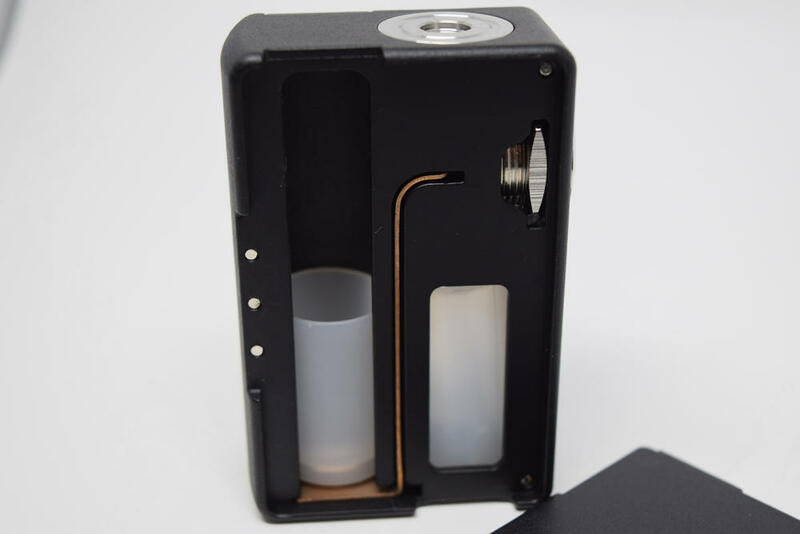 You have the battery slot on the left side, with copper connectors on the top and the bottom and a small silicone bottle in the lower-left section of the mod which connects to the hollow 510 pin to feed juice into your atomizer. You’ll also notice a small mechanism connecting the fire button to the 510 connection. That’s the kill switch that opens the circuit so you can safely carry the Pulse mod inside your pocket without having to remove the battery or worrying that it might fire accidentally. It’s basically a small lever that can be raised or lowered to open and close the electrical circuit. I can’t stress enough how important it is to open the circuit when putting this thing in your pocket. Even if the power button protrudes a great deal from the mod and has to be pressed almost all the way down for the battery to be activated, it can still happen, especially in a small pocket or a purse, so this kill switch is your best protection. The top battery connector is a small, curved copper plate which is a bit sharper than I would have liked to see. You really need to be careful when inserting your battery and not force it in too hard, because it can rip the plastic wrapping and render the battery unusable. Don’t try straightening the plate, because that curvature is supposed to apply pressure on the battery to keep it in place. Just make sure that you insert the negative post of the battery first and then push it up against the plate, to avoid damaging it. One other small con regarding the design of the Vandy Vape Pulse BF box mod is the squonk bottle. I love that it can hold up to 7 ml of juice, but not that it’s made of very soft silicone. Applying a bit more pressure on the bottle can lead to leaking, or, at the very least, flooding the atomizer. You really have to practice with it a bit to learn just how much pressure is necessary to feed an adequate amount of e-liquid to the atomizer, but even so, you may overdo it from time to time. 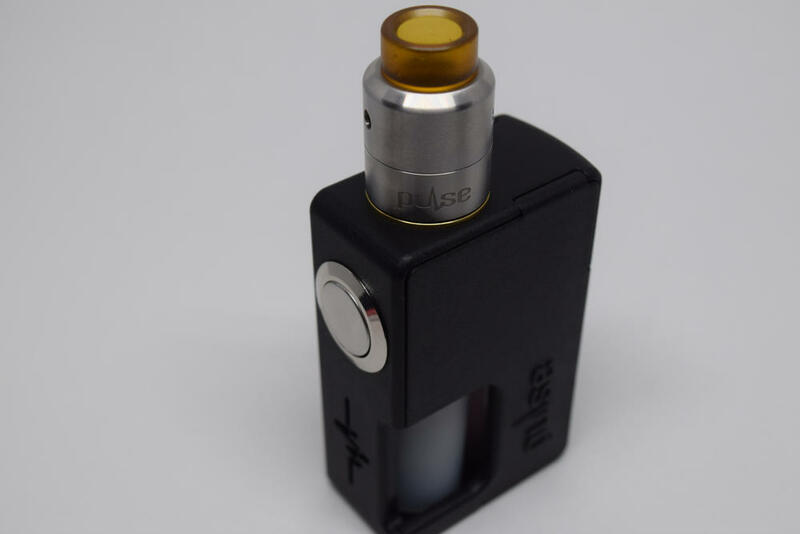 Still, as a whole, the Pulse squonk mod is a very impressive mod, especially of you take into consideration its price tag. Vandy Vape have succeeded in creating an affordable squonker for the masses, and that by itself is worth of praise. But it’s also a very solid-looking device, despite its plastic-shell, this thing is put together really well and can definitely hold its own against any of its pricier competitors. In order to use the Vandy Vape Pulse BF mod to its full potential, you’ll need to pair it up with a squonking-enabled atomizer. You can also use it with a regular RDA or tank, but then you’d be stuck with a basic mechanical mod, and not a very good looking one at that. Luckily, there are plenty of squonking RDAs to choose from these days, including Vandy Vape’s own Pulse 22 and Pulse 24 RDAs. These were designed specifically to be used with the Pulse BF mod so they go great together. I’ve already reviewed the Pulse 22, and will be doing a review of the 24 mm version just to see how it performs with a dual-coil build. 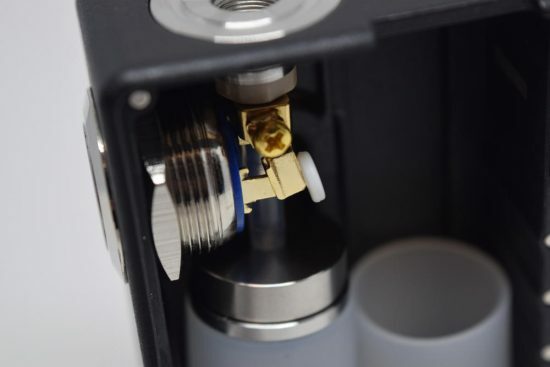 Basically, you need an RDA with a hollowed out connection pin, which allows the juice from the mod’s bottle to reach your wicks when you squeeze or press it. As for the battery, the Vandy Vape Pulse works with both 20700 and 18650 batteries. The mod comes with a silicon adapter for the latter, which sits on the bottom, right next to the juice bottle. You have to be careful inserting either type, because that sharp connection plate at the top of the battery compartment can damage the wrapper. Taking out the battery is a simple affair, thanks to the mod’s dual removable panel design. Just take out both nylon ABS panels and push the battery out from the back. I have to be completely honest and say that I don’t really have much experience with “squonkers” or mechanical mods in general. I’ve just never been drawn to them, and the risk involved in using them has always kept me away. However, the idea of enjoying dripping without actually having to drip was just too hard to resist. However, I don’t really have anything to compare the Vandy Vape Pulse BF to, in terms of performance. It works, that much I can say. You just press the bottle until bubbles start to come up from the tube inside it, press the button and you’re vaping. Some people have been saying that it doesn’t hit as hard as other similar devices, but it seems perfectly fine to me. As I said, having nothing to compare it with, I can’t really tell if it’s underpowered. It has been suggested that the copper contacts are not as efficient as silver plated ones, or that the kill switch doesn’t make perfect contact when closing the circuit, which results in a drop in wattage, but I for one am perfectly happy with how it performs. 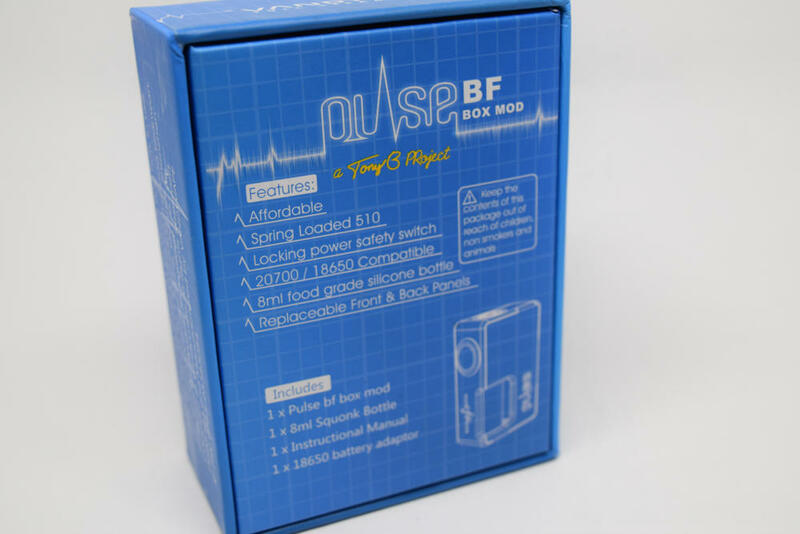 The Vandy Vape Pulse BF box mod is a big breakthrough in my book. It makes squonking a lot more affordable without compromising on performance, so both the Chinese company and Tony B deserve huge props for their work. The Pulse is lightweight, customizable – thanks to the replaceable panels – compatible with two battery types and downright cheap for what it offers. 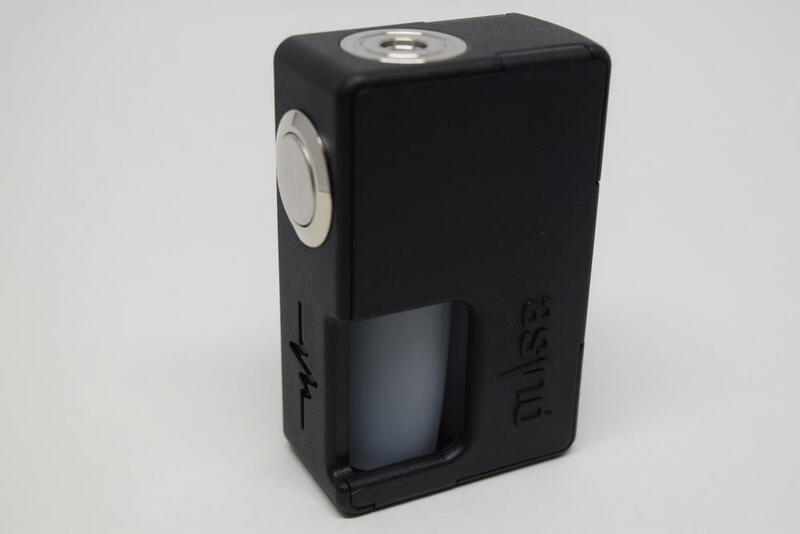 So despite its few subjective cons, I highly recommend the Pulse to anyone who’s been considering trying squonking but found the price too prohibitive. This, my friends, is the device you’ve been waiting for! The guys at E-Smoke were kind enough to provide an exclusive coupon code for the Vandy Vape Pulse BF box mod, check it out below. Its not made from Nylon ABS! Its made from nylon and ABS. I’m not taking the piss here, that just sounded really silly to me when I read it. Thanks for the review, thinkin of getting one of these as a cheap means of trying squonking.